Internationally famous oceanographer Steve Zissou (Bill Murray) and his crew, Team Zissou, set sail on an expedition to hunt down the mysterious, elusive, possibly nonexistent Jaguar Shark that killed Zissou’s partner during the documentary filming of their latest adventure. They are joined on their voyage by a young airline copilot (Owen Wilson), a pregnant journalist (Cate Blanchett), and Zissou’s estranged wife (Anjelica Huston). 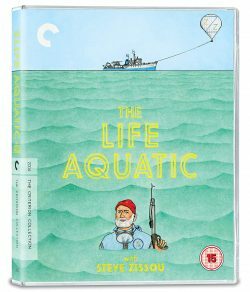 Wes Anderson has assembled an all-star cast that also includes Willem Dafoe, Jeff Goldblum, Michael Gambon, Noah Taylor, Seu Jorge, and Bud Cort for this wildly original adventure-comedy.